Seventeen stories that tell of life and death and those happenings inbetween, where change is all but inevitable. Be prepared for horrors of all kinds, some more subtle than others. First of all, I appreciated the large amount of diversity in this book; from the foreword it became clear that individuals of all shapes of life were given the chance to contribute, and I feel that’s largely absent in anthologies these days. It’s a shame, because nobody, no matter what ethnicity or sexuality or whatever else, should be excluded from such opportunities to expand their craft. I’ll admit however, this anthology started off as rather weak for me, with stories I didn’t much care for situated right at the beginning. Angeline by Karen Runge was about, what I assumed to be, sexual abuse at a young age and the resulting aftermath in later years, whilst The Sundowners by Damien Angelica Walters focused on the complications of old age, and they were certainly interesting to a degree, but they both fell a bit short. Crying Demon by Alan Baxter made me smile, as I’m a personal fan of horror games, yet whilst it held a great deal of potential, it didn’t make it to the top of the list. Still Life with Natalie by Sarah Read was far too verbose, even for my tastes, and Love is a Cavity I Can’t Stop Touching by Stephen Graham Jones didn’t really include all that much. Yes, cannibalism is one of my most favoured themes, but the story struck me as hollow. The Immortal Dead by J. C. Michael also didn't do much for me - I mean, it wasmwell-written but just a little bland. Now, let’s get into the stories that made an excellent impression and completely changed my overall thoughts regarding the book. A man emerges into something catastrophic, where gods freely roam. I feel like this is the one to either love or hate, as it’s left intentionally vague as to what’s actually happening, and it’s that obscurity that might put off a lot of readers. I tried to look at it from a different angle and take events less literal than how they were described by the character. My conclusion and subsequent theory was that his worldly perspective was entirely skewed, perhaps from trauma. I do enjoy tales that hold a deeper meaning, where I need to put my thinking cap on. A cult try to summon A Duke of the Ninth Infernal Circle, yet events take a rather odd turn. This surprised me - I never thought I’d be so entertained and find humour amongst this collection, but Simon Dewar clearly had his head screwed on right, as this in particular was incredibly engaging. Desperate for revenge, a man sets out to hunt down the monster that took his family. I regarded this one as possibly the strongest addition. It introduced me to the taniwha, which compelled me to further read into Māori mythology. It was memorable in the sense that it was a perfect mini-novel, with a start, middle and end that captivated me the whole time. It occurs to me that this review is already too long, so I'll refrain from writing a ten-page essay. Suffice it to say, the rest of these stories had me hooked, and there was a tremendous amount of variety in tone, atmosphere, and writing. In some, like Dealing in Shadows by Annie Neugebauer, I felt emotion, and in others, such as An Elegy for Childhood Monsters by Gwendolyn Kiste, I experienced a sense of fascination. Seriously, every one offered me something new. In conclusion: I believe there's something here for everyone to enjoy. Naturally, there were the weaker links, but it was a simple matter of them not being my sort of thing. 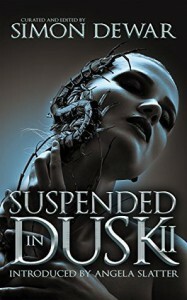 Those that did appeal to me, really made Suspended in Dusk II worth it.